The majority of marine debris originates by being blown, washed or discarded into our waters, where the land meets the sea in our urban areas. Using an underwater robot, Rozalia Project for a Clean Ocean discovered that a large percentage of that trash sinks right where it enters the water. This “beer can reef” lies on the bottom of the harbor in Newport, RI. That sinking trash has formed a new oceanographic feature in our harbors: beer can reefs and reefs of trash. These new formations are a by-product of carelessness and inefficient and ineffective waste management, and are made up of beverage cans, bottles, wrappers, food containers, plastic bags, fishing line, bait bags, baseballs, clothing and more. The concentration of trash in these reefs is an order of magnitude greater than the concentration of trash within the oceanic gyres. A trash reef in Newport, RI’s harbor, for example, has a concentration of up to 41,000,000 pieces of trash per square kilometer, covering 25.2% of the seafloor of the reef area. Compare that to the average concentration of trash in the North Atlantic gyre of 25,000 pieces of trash/km². That tells us we need to be looking closer to home for solutions to clean and prevent marine debris. There may be beer, but this is no party. These underwater reefs are dangerous. They smother the subsea habitat and have the potential to introduce toxins into the water and into the marine (and human) food chain via fish and other creatures that ingest the trash – whole or in pieces. Where proper artificial reefs are made of inert materials that corals and other creatures adhere to safely, these reefs are like an obstacle course of danger for creatures on the seafloor. Entanglement, strangulation and ingestion are all a high risk for creatures having to navigate through the food wrappers, monofilament, bait bags, bottles and plastic bags that are lurking in and on their habitat. Rozalia Project has pioneered the clean up of these underwater trash reefs at the land/sea interface in urban areas, through our use of Videoray remotely operated vehicles to clean the seafloor of trash. The large concentrations of trash in geographically small areas next to land make clean up efforts efficient and economic. While we sometimes partner with divers, when working in urban harbors we generally prefer to keep people out of near-zero visibility water, kicking up sediment and surrounded by trash that may pose an entanglement hazard. As shocking as this photo of the floor of Newport Harbor is, we can clean this up and we believe we can also prevent this from happening in the future – and make a difference to our people, our animals, ocean and our planet. 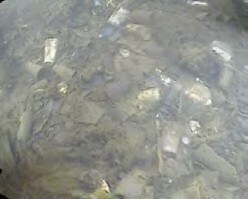 Here’s what we can all do to be part of the solution and prevent urban beer can reefs! 1. Consider this: there is value in all materials – even after use. This value is positive as a recycled material, feedstock for future items or fuel; or has a negative value to our marine creatures, environment and human food chain. 2. Individuals are the first step in getting ahead of this problem. Trash, whether it’s metal, plastic, paper, foam or cardboard, often enters our waters because people are careless, use overflowing trash bins or throw cigarettes on the ground (the filters are made of plastic and should never be allowed to wash into the sea). Reduce, reuse, recycle works to shrink the amount of trash available to blow or wash into the water in the first place, and closes some material loops which does double good for the planet! 3. Let’s demand more recycling, actively managed municipal trash cans, street cleaning, innovative packaging, physical screening on storm drains, marine debris education, fines for littering, harbor cleanup vessels, organized cleanups and focused efforts to restore our urban waters. Individuals who are taking action need some municipal and corporate support – let’s ask for it! 4. Know that every effort that you make helps: whether that is a personal efforts at home, getting involved with cleanups or supporting organizations working toward and innovating for a clean ocean. Headquartered in Granville, VT, Rozalia Project is a 501©3 non-profit whose mission is to protect the ocean with three goals: a protected ocean, a thriving ocean and a clean ocean. During the summer, we operate from the 60-foot sailing research vessel American Promise throughout the Gulf of Maine and operate from dockside locations throughout North America for the remainder of the year. Rozalia Project believes we can clean the ocean and is addressing the problems facing our seas surface to seafloor and from multiple angles of restoration, prevention through education and solution-based research. For more information, see rozaliaproject.org. Rozalia Project for a Clean Ocean.